Below you will find information relating to coding, coverage, and payment for CT bone densitometry. While this advisory focuses on Medicare program policies, these policies may also be applicable to selected private payers throughout the country. The American Medical Association (AMA) developed and maintains Current Procedural Terminology (CPT) codes to consistently identify diagnostic imaging procedures. Medicare relies on these codes to determine reimbursement. The CPT code that designates CT bone densitometry is 77078. When submitting claims to Medicare, procedural CPT codes are reported with diagnosis codes describing the patient's documented medical conditions. 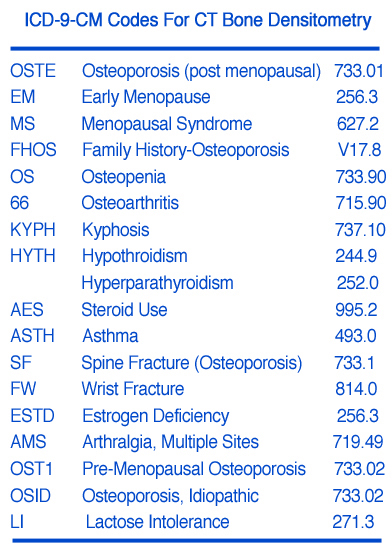 These diagnoses are reported using the International Classification of Diseases, Ninth Revision, Clinical Modification (ICD-9-CM). It is critical that the proper ICD-9-CM codes be listed with the CPT for Medicare claims to be honored. - Contains Current Procedural Terminology (CPT) procedure code 77078. - Contains a valid ICD-9-CM diagnosis code indicating the reason for the test is postmenopausal female, vertebral fracture, hyperparathyroidism, or steroid therapy. Contractors are to maintain local lists of valid codes for the benefit's screening categories. Contractors will deny claims for screening tests when the ICD-9-CM diagnosis code is omitted. reimbursed under an Ambulatory Payment Classification (APC) under Medicare's hospital outpatient department prospective payment system (OPPS). For procedures performed in an IDTF or physician office, the technical component is reimbursed under the Medicare physician fee schedule. The professional component is reimbursed under the Medicare physician fee schedule, regardless of the setting. Third party coverage policies for bone densitometry vary by payer and locality. The local Medicare contractors have discretion to determine the specific circumstances under which a CT bone densitometry scan is covered.